The confirmation as an original by the eighteenth - century Venetian view - painter, Antonio Canaletto, of a painting of A Capriccio with Roman ruins and a bishop's tomb in the University collection, much publicized in the national press in March 2018, provides the opportunity to explore both the stylistic context of the picture and the mid - nineteenth century bequest to Marischal College of which it formed part by the collector Alexander Henderson of Dyce. The Capriccio with Roman ruins and a bishop’s tomb has in the past hung in various locations in the University, from the Court Room in Marischal College to the Principal’s Lodgings in Old Aberdeen, but it was often assumed to be either a studio product or a work by one of Canaletto’s followers. 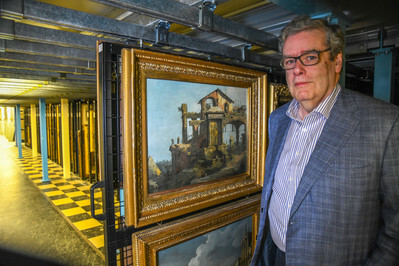 John Gash, Senior Lecturer in the Department of History of Art, however, suspected that it was an original and enlisted the help of two outside specialists on Canaletto, Charles Beddington and Francis Russell, who both confirmed it as autograph. The results of this research were jointly published by John Gash and Charles Beddington in an article entitled “Paintings by Canaletto and his Father in Aberdeen University” in the December 2017 issue of The Burlington Magazine. The reference to Canaletto’s father is to Bernardo Canal, a painter of stage scenery who was his son’s teacher, and whom Beddington and Gash propose as the author of another picture in the University, a View of the Grand Canal with S. Simeone Piccolo and the Scalzi. Both paintings were bequeathed to the University in 1863 as part of a much larger bequest, including now world-renowned Greek vases, by Alexander Henderson of Dyce, whose collecting activities will also be discussed in the talk. The talk will coincide with a small temporary display of the pictures in the Library.